Leverage our live election results maps & feeds to give your audience fast, accurate data as soon as polls close. 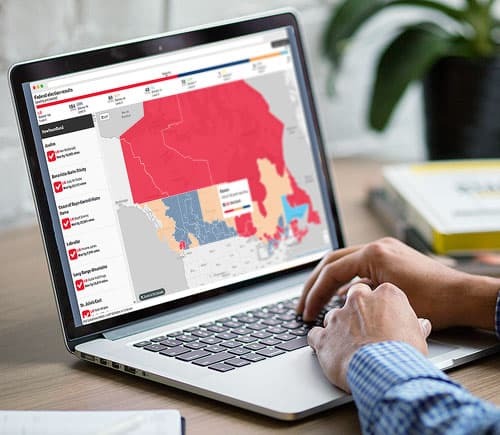 Available in English and French, the responsive, mobile-friendly election results map is powered by our API and updated in real-time for clients needing a turnkey solution. Hosted by AWS to ensure fast, reliable performance at even peak usage times, the map can be quickly and easily embedded on your site within minutes. The results feed is perfect for clients interested in powering their own maps and applications. We give you data to maximize time-on-site on your platform. Let visitors view results for ridings and candidates, or demographic data such as age, income and visible minority population. Looking for Canadian election news content? Get real-time, reliable provincial and federal election news articles, photos, graphics, audio and video from The Canadian Press. The Associated Press provides live results maps and data feeds for U.S. elections, available to Canadian newspapers, broadcasters and other media companies through CP. Results tabulated for U.S. state, national primary and general elections. In the last major election, AP called 4,653 contested races with 99.9 percent accuracy. Unrivalled U.S. election news coverage of voting patterns, candidate profiles, historical data, campaign finances and more. Ready to give audiences real-time, reliable Canadian & U.S. election results? Answers to your questions about our election results map, feed, pricing and more.